This Valencia guitar is a decent choice if you are looking for a budget nylon string package for children who are ages 7 to around 10 or 11. It is a 3/4 size model, which means that it is three quarters the size of a full-sized guitar. ¾ size models are perfect for younger kids because they are much more comfortable to play than a full size, which in turn makes the learning process that much easier. The guitar is made by Valencia Guitars which is a company out of Australia, although the guitars are made in China. Valencia offers a range of different models for beginners that generally have good design, are reliable, and have a good sound. This 3/4 Size has typical Spanish guitar styling with the standard classical setup. So the bottom three strings are nylon wound with wire strings, and top 3 are nylon strings. The tuners are classical style open tuners, and it has a nato wood fretboard and bridge. If you buy the starter kit, you also get a free instructional DVD which is handy for kids who are just learning to play. Overall the length is 36 1/2″, the width of the nut 1 11/16″, and the scale length is 23″. The weight of this 3/4 Size is very light, and that helps with comfort when playing. 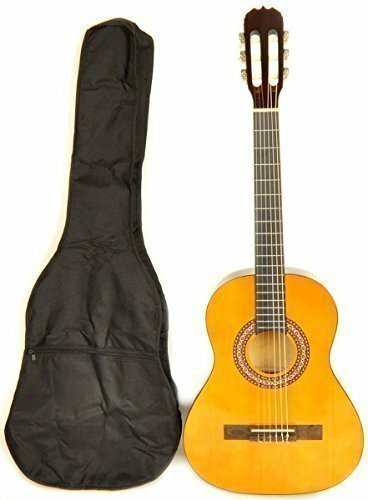 Since it classical style it has the nylon strings and slightly smaller body size than a 3/4 size acoustic so it is a bit easier on kids fingers and the body is comfortable to hold because of the size. This model has excellent sound for a guitar in this price range. It is not a high-end instrument so you cannot expect it to sound like one, but for what you are paying it is quite good. Again for the price, you cannot expect a perfect guitar with no flaws and high-end craftsmanship, but this model is well made for something in this price range. Classical guitars aren’t generally made to be worn with a strap so there is no strap attachment with this Valencia, although you can purchase a device at a music store that will allow attaching a strap if that is something that is needed. Overall this is a nicely made, decent sounding, budget guitar that can make a great starter instrument for a child who is interesting in learning to play but might not stick with it. If your child is taking lessons I would try to get a slightly higher quality model, maybe something like the Yamaha CGS103AII 3/4 Size Classical Guitar would be a good choice.